IMHO specific camera maker or model is irrelevant, perhaps in some instances the sensor type, i.e. full or crop, can be relevant especially of course when it comes to focal length. But I respectfully submit. If a person is a competent (notice I did not say good) photographer that person can make good pictures even prize winning pictures with any camera. We all know its it’s been done. Pixel peeping aside. Back when film was all we had pixel peeping wasn’t possible or necessary. I don’t think viewers or critics went around with a magnifying glass to see individual ink droplets. As it is so often said the camera is just a tool much like a hammer, chisel, or saw and in the hands of a competent carpenter can make beautiful furniture. but I do not really understand your point otherwise. Of course anyone can make good images on anything and that is the point. If someone produced a great image on an I-Phone, I would like to know that. if an image if really noisy and I have no idea that the photo was at iso6400, how can i comment? It would be nice to know with the parameters are before I comment on it. Otherwise what are we commenting on, simply whether a photo looks nice or not? I am not quite certain where this thread is headed, but, as my French grandmother used to say, “I don’t know what the argument is about, but I’m opposed”. Now seriously. Listing image data is neither banned nor mandatory, and the same is true about reading them, or even about being interested in them. I wish that most things in life were this simple. Second. I always list the following information, in this order: the lens that I used with an approximate value of the aperture (since I now only use vintage manual focus glass this information is not recorded in exif), then the camera with ISO and speed settings and exposure compensation, then the processing software that I used and, if warranted, some details about the processing itself. Why do I keep to this routine? Because the image is produced by the lens, not by the camera. The camera is just a recording device, and all current digital cameras are more or less equally proficient within their categories and price ranges. I only use Sony full frame cameras but I have never used a Sony lens, and probably never will. Why Sony? Because, as I said, I only use vintage manual focus lenses and until a few months ago Sony was the only manufacturer (other than Leica…) that offered mirrorless full frame bodies (the fact that their sensors are superb does not hurt either), and using vintage glass with DSLR’s is not as straightforward as doing so with mirrorless cameras. I have no “brand attachment” beyond these practical matters. So why do I emphasize the lens in all of this? Because different lenses have different characteristics that no camera and no processing software can emulate. If the camera and the software are any good (and the operator knows how to operate them) all they can do is faithfully to translate the image produced by the lens. No amount of sensor technology or Photoshop wizardry will give you the contrast of a Leica lens, the sharpness of a Zeiss or the color and bokeh of a vintage Rokkor or Hexanon. I feel that when I post an image I have to share this information for two reasons. First so that if somebody is interested to know why an image looks the way it looks (whether good or bad, and this may be largely subjective) they know where the look comes from, and can choose to avoid it or pursue it. Second, to do justice to those engineer/artists of years gone by who created optical masterpieces with little more than a slide rule and a drafting table. But, as I said at the beginning, people are free to read or not read any of this information, and to find it useful or useless. I would not be upset if most people just don’t care, but I would be upset if even one person who might have cared did not get the information because I did not list it. Did you read initial post? I just realized I didn’t actually answer your question about what I meant about camera data. Well, I didn’t say "camera data ". Here’s what was asked "I was just wondering why is that everyone, including myself, still list the camera they use in their pertinent image data? " I guess I wasn’t very clear since many people replied by saying “if what I mean by camera data…”. There are reasons camera body is informative. There was a time that fuji was the go-to sensor for skin tones. I could see where the same might apply for a photographer who might be specializing in a certain breed of birds for instance. Knowing that a camera model has a tendency to blow out the red channel might be helpful. As well, shooting RAW is not always possible when doing volume work, camera buffer speed, etc. and a photographer would need to shoot cooked in jpgs. I have to confess—I post all of the relevant camera, lens, crop, processing data for two reasons only: 1) Nikon View reports it in editable form, making it easy to copy and paste most of the information; 2) this is a teaching and critiquing forum and a lot of the members can benefit from the information. I know without a doubt that I have gained knowledge when I have taken in the bones of the process from a full disclosure and frustration when someone posts an image and doesn’t make obvious how the dickens they achieved it. I know that for some here, they are ahead of me on the learning curve. I know that others are behind me. But I feel obliged never to waste a teachable/learnable moment. I guess I disagree; I think the brand and model of camera IS relevant. If we are talking about critiques, then the camera someone is using give you a reference from which to base your answers to any questions they may have. Also, technically speaking, some lenses work better with certain cameras than they do with others. I have heard that this can important for the super telephotos, such as what birders would use. If you are talking about the regular Gallery, where people are simply posting images and not looking for help or critiques, well, then I guess is it up to that person how much info they want to post. I LIKE to see all the info on type/brand of camera, lens, F-stop, shutter speed, cropped, processing work, etc. For me, there is a HUGE difference between images that are primarily a plain photograph, and an image that is primarily Photoshop. We are talking about the image it self not about the post processing. IMHO the image should stand alone from processing and be judged or critiqued on its merits not on the post processing skills of the submitter. That is unless the poster ask for suggestions or critique of post processing, which to my mind (as it is) would require the submitter to list all edits. I would suggest submitting an image for critique is like submitting it to a contest. Are contest judged by what camera took the image? Yup, I guess we have to agree to disagree. You said we are talking about the image itself, not the post processing, but, the post processing can be a MAJOR part of an image. In fact, that processing IS the image. Very few images are posted straight out of the camera. One of the people who replied above said he didn’t post all that info unless asked, and he did blends and image stacking, which will give an image that is completely different from a single exposure. That is at least partly why so many of the big nature photo international contests have restrictions on what kind of processing can be done to an image, and some of them want to see the RAW file. …OK, all done! Interesting Thread. I have been evolving my opinion on providing camera setting and meta data on my website for my images articles for an number of years and finally settled on standard approach. I believe that an image stands alone. That everything from post-processing, how you got to the location, technology used, etc is not important. However for the maker that information is meaningful and can be part of the inspirational path of creating the final image. My ah-ha moment came with a workshop with Alain Briot, who opinioned that an artist must go thru stages to create and end at his final art. Stages cannot be skipped. The stage you are in can be short or a long time periods. Stages can be inspirational towards the next stage. Stages can be anchor points for reflection, and re-reflection. Often for my travel images it may have taken me heaven and earth to get to a travel location. The time, date, location, camera, and lens used at my point of capture may seem irrelevant at that moment but it is part of the dna of the image and therefore what caused me to release my shutter. This camera information may be germane to me as the maker for my use in the technology stage of my image making however the information may have the effect of fodder for the viewer. 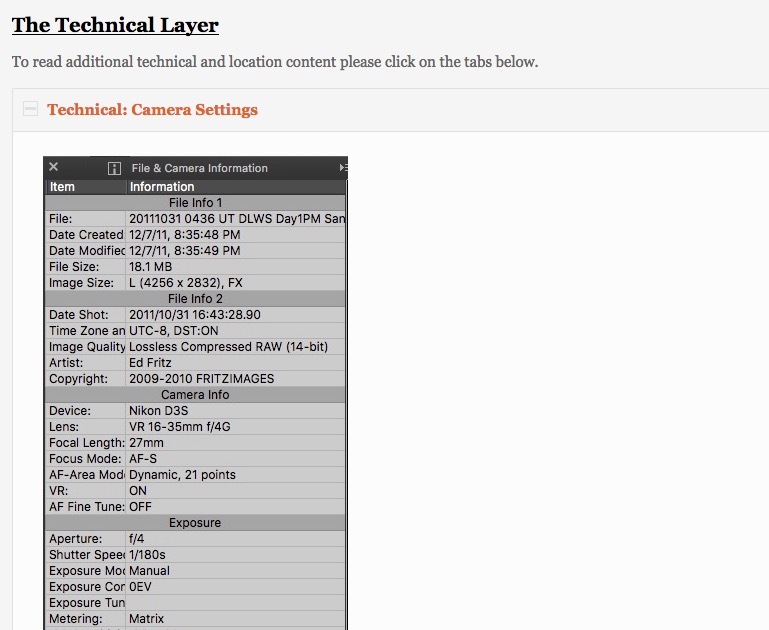 My compromise has been to screenshot the camera setting data and paste the camera setting into a Technical Layer Tab. That tab is hidden, until the viewer opens. accordion style. As the great Oz said. Fritzimage, your response has articulated the reason I put the question out there and states my position on the issue better than I was able to do. Thank you so much for taking the time not only read but share your wisdom. Thank you George for your reply. I appreciate your thoughts and comments. I am new to NPN and am thinking of joining so I am learning the environment of the site and members. I think what would be interesting is to see what all was done to manipulate the image this would be from a purely investigative standpoint to know whether or not the image was good before manipulation. To me as a photographer I want to see if the image was good as taken or had to be manipulated to look good. To me it’s not being a photographer to take an image and put it in a high-powered software and make changes to it to make it look like it was taken well. That’s not being a photographer to me, being a photographer is getting the image as close to right as possible in the camera. Now that said I do believe that it’s okay to do some minor manipulation to an image but if you’ve got to go in and do a lot of adjustment then you know you haven’t really used the primary tool which is the camera. Maybe I’ve missed the point of being a photographer and that is to use the camera not Lightroom or some other high-powered software. Just a reminder to keep this discussion civil everyone. There are lots of views on this and there is no black and white (no pun intended ) answer. Arguments can be made for either side. Ansel Adams never had what is available today. No offense but I am tired of that old and tired response because it is irrelevant and unjustified. How can anyone say what Ansel Adams would or would not do? Besides, frankly I wouldn’t care if he agreed or didn’t. In my opinion using the darkroom to enhance a photograph is far more different than using the software available today. Again though my point is that the skill of a photographer is the ability with the camera, exposure and composition, not wholesale manipulation of bianary data. That’s my opinion and I’m sticking to it. No amount of attempt to invoke the unspoken thought of a dead person will disuade me. Just a healthy discussion. No malice intended. Isn’t it what everyone says is needed is a frank discussion? No one is calling any names here just a good open and honest discussion. Arguments can be made for what side? I am civil here but the discussion about whether post processing images is “real” photography or not is silly.